Nail Training UK (Nail Harmony UK) has over 35 highly skilled Harmony Educators across the UK offering the very best training for Beginner, Intermediate and Advanced Nail Technicians. Training is available within our Regional Training Centres or within your own salon or college environment if you have several people who require training. Many insurance companies require product training as a condition of cover. They understand the value of high-quality, in-depth product training that will instil knowledge and skills to help you grow your business by offering accredited, certificated nail services. Invest in yourself and your employees and provide the best service to your customers with the best products and training on the market by making Nail Training UK your chosen education supplier. Small classes and 1-2-1 training are available to ensure you receive the maximum attention required to truly understand and develop the skills required to become the best technician you can be. Ongoing support and assistance come as standard. 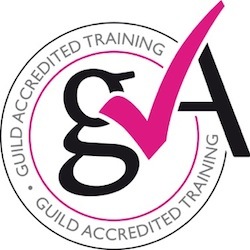 All courses are accredited with The Guild of Beauty Therapists.